Including a stellar lineup of the best locals in town! 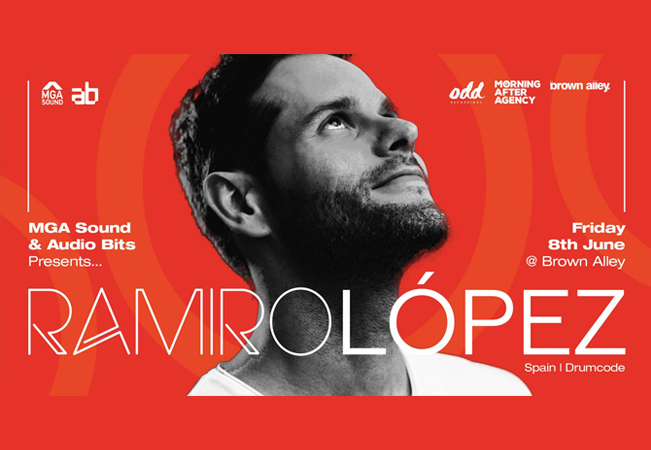 Were passionate about music and love to create great experiences so come on down to see Spanish music legend Ramiro Lopez do his thing upstairs at Brown Alley. His musical creativity and innovation has always been latent thoughout his life. So in around 2006, Ramiro made the leap to music production, researching and acquiring knowledge, experiences, sharing concerns with other artists and gradually defining him. But the wheel never stops and Ramiro is constantly evolving: involved in many projects, his desire since the beginning is to make people live and enjoy what they listen to while he is working at the booth. He has collaborated with great artists and gigs traveling all around the world and playing in cities from Sao Paulo to Beijing, Barcelona or Ibiza delighting everyone with his music. We can say without doubt that this is part of the new wave of Spanish artists. With a lot to offer Ramiro is an artist to bet for.